We are writing to you today to update you on our son, Luis Jovel, Jr.
As most of you know, four years ago, at age 12, our son’s life was forever changed. Luis (Junior) was struck by a speeding police car while crossing the street in front of our home on the way to visit a friend. Junior is now a quadriplegic and has permanent brain injury. He requires assistance for all personal care, turning, transfer functions, and many everyday things we take for granted. He is truly a living miracle and has come a long way from that tragic day. Junior is now in the eleventh grade at Clarksburg High School. He is a very good student and is working extremely hard to achieve his goals in life. His strong faith in God has helped him thru his most difficult challenges. He hopes to go on to college and major in chemical or mechanical engineering. He wants to go to a top ten University and does not want to settle for less in his academic career. He has high hopes in life and this is truly awe inspiring to all of us. 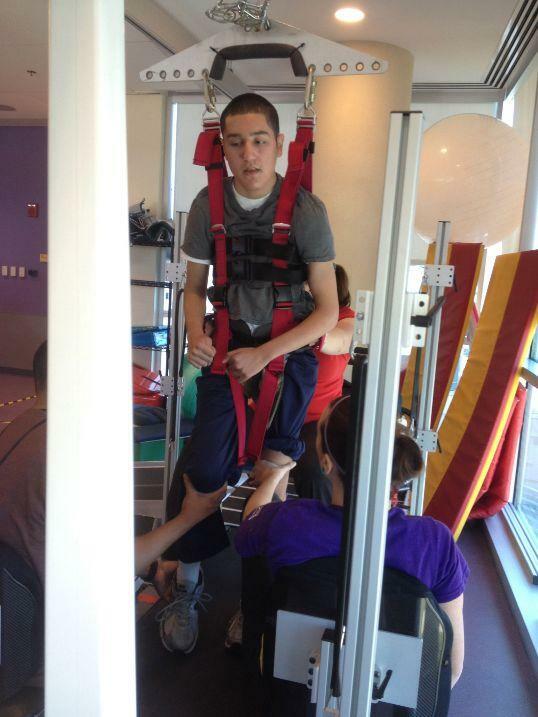 For three hours each day he continues rehabilitation at home and when off from school he continues physical therapy at the International Center for Spinal Cord Injuries at Kennedy Krieger in Baltimore. Much of Junior’s success is due to his courage and the hard work he puts into his school work and physical therapy. He has hopes to walk again or to just become a little more independent. We are working extremely hard to help him achieve his ultimate goals in life. He deserves it! This past summer, Junior trained with Canine Partners for Life (CPL) in Cochranville, PA to receive a fully trained Working Service Dog. 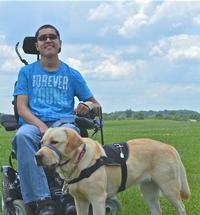 He now is a Full Service Dog Team with his partner, Millie, a three-year-old Yellow Labrador. Junior worked very hard with CPL training Millie to help him with his needs and now the two have a wonderful relationship. Junior is so proud that he can now take care of someone else; it gives him a sense of independence he desperately desires and needs. He also spent 8 weeks at Kennedy Krieger in an intensive rehabilitation program. To ensure his ongoing rehabilitation, and minimize the risk of secondary illnesses Junior continues to require far more assistance and therapy. In addition, we are hoping someday to be able to build a handicap accessible bathroom and bedroom for Luis which will give him some independence as he continues to grow into a fine young man. Junior has high hopes of living an independent and full life. He is truly awe inspiring. We are grateful for all your support in the past and ask for your continued support in helping him achieve each of his goals. On behalf of Junior and our entire family, we thank you for your continuous kindness, prayer and generosity. Family cares for son paralyzed after being struck by a police car in 2008. I am hopeful that medical research will continue to develop and be of great benefit to you. You are most deserving. Hey Luis! It's Ms. Smetanick! Just want to let you know I am sending this link to everyone I know... You are in my daily prayers! I'm so happy to read that you are aspiring towards an engineering degree. I know you got what it takes! !